With the success of their first concept, the owners of Prickly Pear Taqueria at Plaza Midtown will take up the rest of the space with a separate pizza concept. While both spaces were originally part of the short lived Amore, Prickly Pear had originally only taken part of the space. Pie 950 Pizza Tavern (the address, 950 W. Peachtree Street) is scheduled to open within the next 30 days and will feature pizza, calzones, subs and gelato among other offerings. The gimmick here being that it is billed as a "European Pizzeria" with large flat panel TV's showing soccer games. With pizza and burger places popping up all over the city, it seems as though Prickly Pear could not resist getting in on the craze. 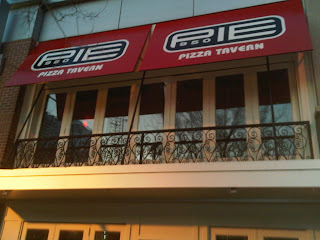 Currently their existing concept does offer pizza so that may change once Pie 950 opens. All I can say is that they better bring their "A" game with this concept. While the reviews of Prickly Pear have been mediocre at best, there are not nearby alternatives for that style of food. Pizza is a different story, and with Antico Pizza Napoletana, Varasano's Pizzeria and a number of Domino's and Papa John's nearby, their pies better be good!